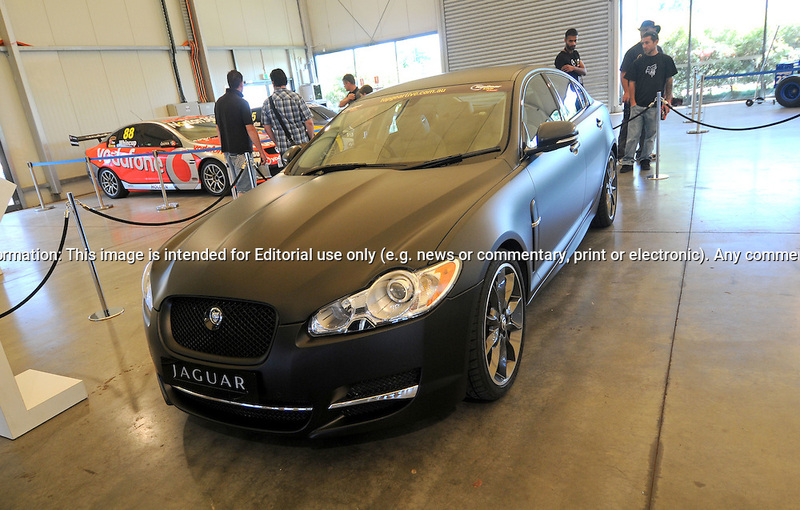 2011 Jaguar XF with Special Matt Black Wrapping - Topgear Live Festival.The Melbourne Showgrounds .Flemington. Melbourne, Victoria.13th March 2011.At the heart of the Festival will be a 1.52km, purpose-built track which will weave through the streets and buildings of the showground precinct..The Top Gear Live track, the first ever to be constructed in Australia, will play host to over 120 of the country's best drivers as they take part in a spirited competition to set the fastest Top Gear Live lap..With over 20 corners, ranging from the tight and technical 'Woodchop' and 'Town Square', to the fast and furious 'Power Arena', spectators will have unprecedented access plus the opportunity to get up close with drivers and cars, as well as checking out all the action. Cars likely to be on the track range from the likes of V8 Supercars, multiple Bathurst's 12hr class winners, prototype race cars, historic and modern tarmac rally cars, V8 muscle cars and historic open wheel racing cars..(C) Joel Strickland Photographics.Use information: This image is intended for Editorial use only (e.g. news or commentary, print or electronic). Any commercial or promotional use requires additional clearance.